Preliminary design plan for a cable ship. The Office of the Chief of Naval Operations (OpNav) requested on 18 August 1921 that the Bureau of Construction and Repair develop plans illustrating the potential characteristics needed in an ocean going ship capable of carrying and laying undersea communications cable. 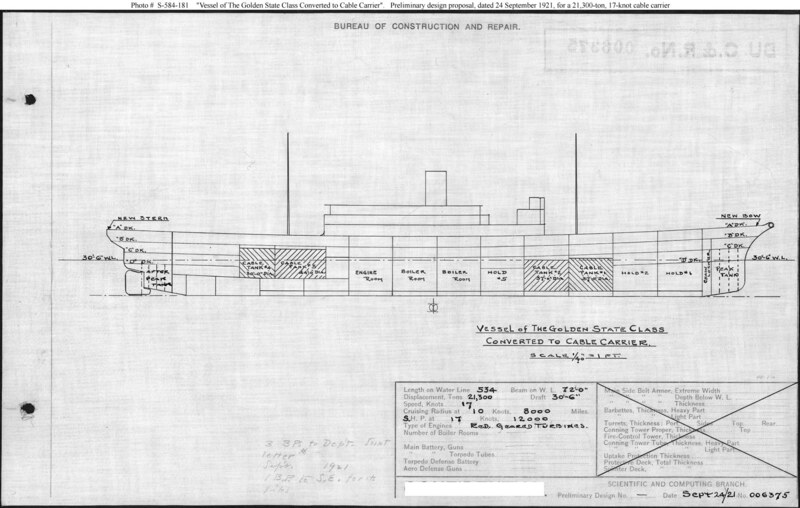 The Bureau considered the Golden State type passenger and cargo ship to be the most promising existing commercial type available for conversion. This plan was forwarded on 29 September 1921 to OpNav. The Navy did not acquire cable laying ships at this time, however. This plan provided the capacity to carry and lay about 2700 to 3000 miles of underwater cable, turbine machinery, and a speed of 17 knots in a ship 534 feet long on the waterline, 72 feet in beam, and with a full load displacement of 21,300 tons.